Shown is a scene from a past Appalachian Artisans Guild Cabin Fever Arts Festival at the Southern State Community College Patriot Center. Folks interested in creative arts and crafts should mark their calendars for Saturday, March 9. On that day, the Appalachian Artisans Guild will present its 16th annual Cabin Fever Arts Festival in the Patriot Center on the Hillsboro campus of Southern State Community College. Admission is free and open to the public, and doors will be open from 10 a.m. until 5 p.m. The event showcases handcrafted traditional folk art and unique fine art by juried artists. 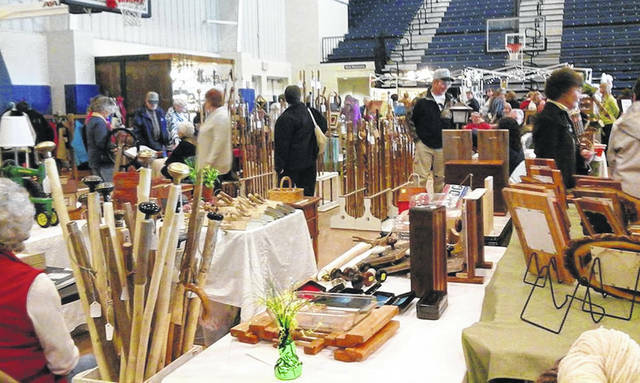 More than 60 booths will offer an array of quality work, including quilts, jewelry, pottery, clothing, paintings, metal and woodworking items, toys, foods and more. Most items are for sale, giving an opportunity to obtain one-of-a-kind pieces of art not available in stores. Visitors can also watch some of the artisans create work in their booths, and all of the artists are happy to answer questions and discuss details of their particular craft. Come and visit with Highland County artists, including three Guild members. Leesburg resident Brenda Armstrong turns vintage wallpaper, buttons, and other treasures into bandboxes and wearable art. In her skillful hands, old coats find new life as adorable teddy bears. Another Highland County resident, Elaine Balsley, enjoys painting a wide variety of subjects, including classic aircraft for the U.S. Air Force Academy Art Program. She also does hand-painted images on wood, trays and other unique surfaces, in addition to hand-quilted items. Adding to the festivities will be live music, with Steve Free scheduled to perform. Lunch items can be purchased from Steve’s Ridge Top BBQ food truck. For more information, visit www.appartguild.com or email at cabinfeverartsfestival@gmail.com. Submitted by Appalachian Artisans Guild.